6 New Gun Control Laws Enacted In California, As Gov. Brown Signs Bills : The Two-Way The capacity of guns' magazines will now be limited to 10 bullets, and background checks will be required to buy ammunition. The new laws also target "straw purchasing" guns for other people. Gov. Jerry Brown signed six new bills into law Friday, nearly seven months after a mass shooting in San Bernardino, Calif. Two of the new laws restrict ammunition. 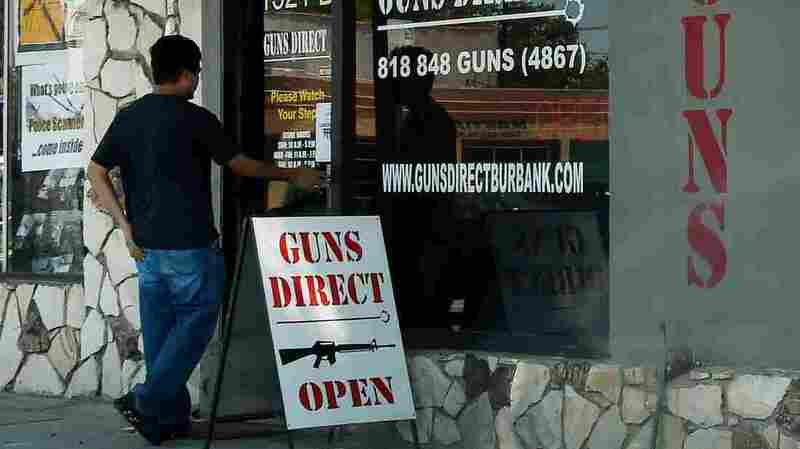 In this photo from last summer, a man enters a gun store in Los Angeles. Gov. Jerry Brown has signed new gun control legislation for California, enacting bills that limit magazine capacity to 10 bullets; require a background check for those purchasing ammunition; and restrict the lending of firearms, among other effects. In signing the bills, Brown said he wants "to enhance public safety by tightening our existing laws in a responsible and focused manner, while protecting the rights of law-abiding gun owners." "The loophole refers to the sale of 'California legal' firearms that don't fall under California's ban of guns with detachable magazines. "To get around the law, manufacturers created versions of firearms that feature a button that can be pushed with a small tool — for instance the tip of a bullet — to release an empty magazine and insert a new one." Another bill that will now become law tries to limit "straw purchasing," the practice of a person buying a gun legally with the intent of giving or selling the weapon to someone else. In addition to making it a misdemeanor to file a false report about a gun being lost or stolen, the new law will prohibit the purchaser from buying another gun for 10 years. "Legislators established the 'assault weapon' as a new classification of firearm in 1989. Following a court challenge in 2000, the law was upheld. Gun owners could keep their assault weapons provided they registered with the state before Jan. 23, 2001." All of the bills Brown signed were sponsored by Democrats — and so were the five bills that he vetoed, although one of those, which makes it a felony to steal a gun, was also sponsored by Republican Assemblywoman Melissa A. Melendez. In rejecting that bill, Brown said a similar measure is already slated to appear as a state ballot issue in November. Brown vetoed another bill that would make it a misdemeanor not to report the loss or theft of a gun, saying he doesn't believe the measure would help stop gun traffickers. He added that the bill wouldn't make irresponsible people become responsible. An earlier version of this story wrongly stated that Assemblywoman Melissa Melendez's legislation would make it a misdemeanor not to report the loss or theft of a gun. We've corrected that error to reflect the fact that Assemblywoman Melendez's bill would classify "the theft of a firearm grand theft in all cases."